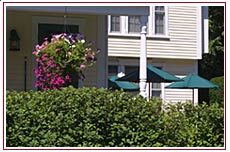 We have a variety of accommodations available for your stay on the shores of Lake Winnipesaukee. 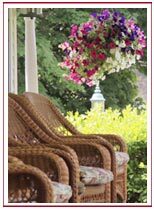 You may choose a guest room or suite in the main house, or a cottage of your own along our garden path. All rooms are decorated in their individual Victorian settings with queen beds, private baths, and air conditioners. Many also feature yellow pine paneling that give them a warm feeling throughout the year. Nearly every room in the main house offers a waterview! If relaxation is in your plans, may we suggest an accommodation that offers a separate sitting room and your own two person jacuzzi. Select either the three level Tower Suite on the third floor of the main house or The Lighthouse with two levels in the garden.The Little House in the Cove features privacy with your own porch, bedroom and full bath. Wireless connection available throughout the inn and in all rooms and cottages. RATES: These are nightly rates for two in the room. Click room name for photos and details. short walk above the inn, queen brass bed on first floor, spiral staircase to 2nd floor bath with jacuzzi. Private porch for two withh lake view. short walk down the brick path from the veranda, queen brass and iron bed, cathedral ceiling with ceiling fan, and private porch for two. Coffee and tea is available every morning in the living room of the main house. There are a number of restaurants close by for breakfast, lunch and dinner whether you are in seach of something light and casual or fine dining. Four nearby area restaurant provides our guests with a 10% discount off lunch and dinner. Please ask us for details and recommendations..
A deposit equal to one night's stay by credit card or cash in advance is required to guarantee a reservation. Motorcycle Week: Absolutely no refunds for reservations cancelled after May 15. Check-In Time: Between 3:00 p.m. and 6:00 p.m. If you will be arriving after 6:00 p.m., arrangements will be made in advance for your late arrival. Please be sure to let us know when you make your reservation. The Inn at Smith Cove is a non-smoking property. Failure to comply with this policy will result in a $100 cleaning fee. Smoking is allowed outside only. If you are traveling with a group or simply interested in more private accommodations, read about our Vacation Rentals available Summer and Winter! We hope you will enjoy your stay at the Inn at Smith Cove.